Who Can Be an Instructor? You! Otauna is excited to offer materials and products for dotting event instructors. 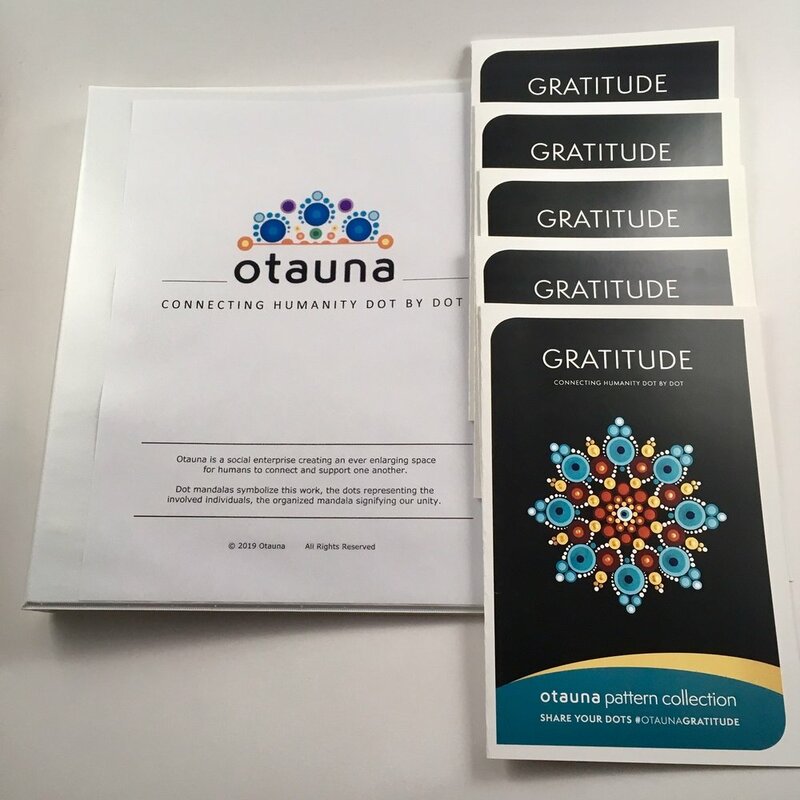 The information on this page is for those who are eager to share Otauna’s mission while leading dotting events open to friends, family, and community. These could be for personal profit, with a regular group of dotting friends (we like to call it a Dotting Club), and range in frequency and the number of participants. Separate programming is available for people who support the well-being, growth, and development of others through their work environment. Please visit our For Schools & Non-Profits page if this better describes who you’ll be dotting with. Otauna’s step by step pattern system and corresponding materials are designed by educators, setting you and your participants up for success. Connect your dotters to others around the world through Otauna’s programs and social media platforms. Earn money when you opt for dotters to pay to participate in your events. After the initial Starting Pack purchase, instructors receive a 25% discount on products for reselling at their events. Your involvement supports the Otauna mission, with a portion of every purchase you make funding our global programs. To get instructors geared up, we’ve structured Starting Packs with lots of options so you can fine tune what you receive to fit your price point and vision for your dotting events. All Starting Packs found at the bottom of this page include an organization binder and Handbook for Instructors. Think about the number of participants you will first work with and build your Starting Pack from there. Each package includes a corresponding number of set of 7 dotting tools, our recommendation for those first time dotters you will be working with. You will be able to buy more Otauna items at any time. Please see below. As you structure your package, decide how many sets of printed patterns you would like. You may decide to keep your pattern copies neat and organized in your binder, using them over again with multiple groups. Alternatively, you may plan to build the cost of the printed pattern ($5 Canadian each) into the price to attend your dotting event, with participants leaving with their pattern copy. Either is great and follows copyright rules. Each set of patterns includes a free Instructors Guide. The number of copies in each set will match the type of Starting Pack you select. For example, if you choose Starting Pack for 7, there will be 7 copies of each pattern you select along with the corresponding Instructors’ Guide(s). For pattern specifics, click here. A product purchasing area with your 10% discount applied. A spot to buy more copies of printed patterns and pay for the use of digital patterns. A place where you are welcome to tell us about your events and who participated. Every participant who gives you permission to share their email address with us will be added to our newsletter list, receive our Welcome Package with two free patterns, and be entered in a draw to win an Otauna e-gift card. If your participant wins, you win an e-gift card too! Resources to help with the instruction process. Do I need to sign a contract to be an instructor? No. Otauna originally had a role called Community Host. Is this the same thing? No. Using Otauna’s materials to instruct groups is open to everyone. As Otauna evolves, we will once again revisit the role of Community Host. When we are ready to implement the role, there will be an application process as Community Hosts will be critical to connecting their community to Otauna’s work. Am I able to have my group(s) paint patterns from the Dot for Charities program? Yes, as long as you pay for each copy produced or shared electronically by logging into the Instructors’ Corner to do so. Please note that this does not add to the amount Otauna donates to the charity of the month. If you dot with the same group of individuals on a regular basis, each person can be a member of the Dot for Charities program so that everyone is represented within the amount donated. May I use digital patterns I’ve purchased in my dotting events? Yes, as long as you pay for each copy you produce or share electronically by logging into the Instructors’ Corner to do so. The Starter Packs include the set of 7 dotting tools. Can I use the set of 8 dotting tools at my events too? Yes. Although we recommend participants start with the set of 7 dotting tools, the set of 8 dotting tools can be used with success soon after a person learns the pattern process. You will likely have repeat dotters at your events who will enjoy the option of using the set of 8 tools. These are available for purchase in the Instructors’ Corner. Where can I find more information to make sure I’m respecting copyright laws with regards to using Otauna’s patterns and content? We have posted information on our main FAQs page. If your question still isn’t answered, please contact us. Will more patterns and products be developed? Absolutely! When you purchase your Starting Pack, you have the option to be added to our instructors email list. We use this to update instructors on exciting new products, patterns, and ways to connect your dotting group(s). Am I able to have my group(s) paint Travelling Kindness Rocks? Not yet. We have plans to restructure this program so more people will be able to take part as dotters. We will be looking at how instructors can be involved and anticipate instructors playing a key role in the new structure. We hope to rebuild the Travelling Kindness Rocks program sometime in 2019.